From that title you might be thinking that much of our wanderings so far since leaving CT have been fowl- but not foul by any means! So allow me to deviate from my usual chronological postings while I present “Feathered Friends – a Short Story or Two”. 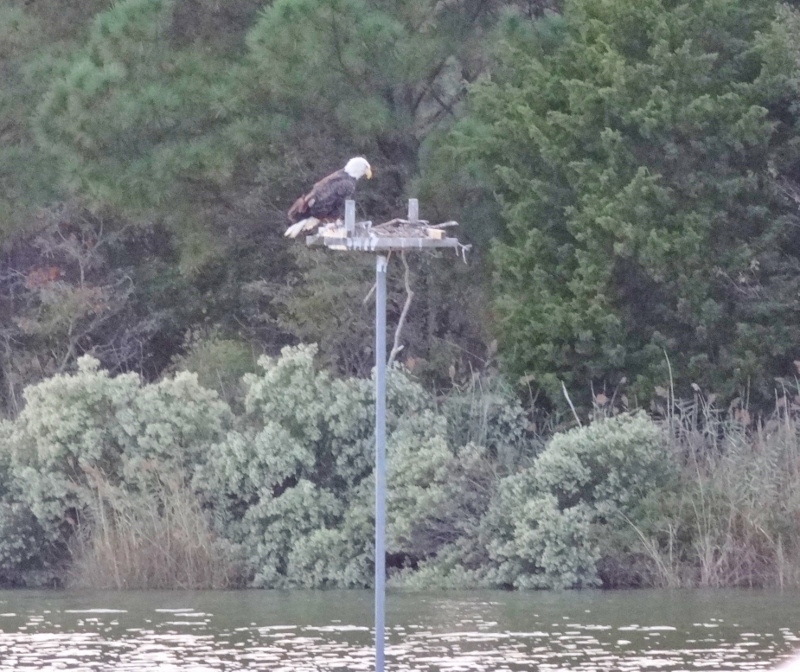 Anchored in San Domingo Creek at St Michael’s we saw an eagle land on a nearby osprey nest; not a common sight at all. 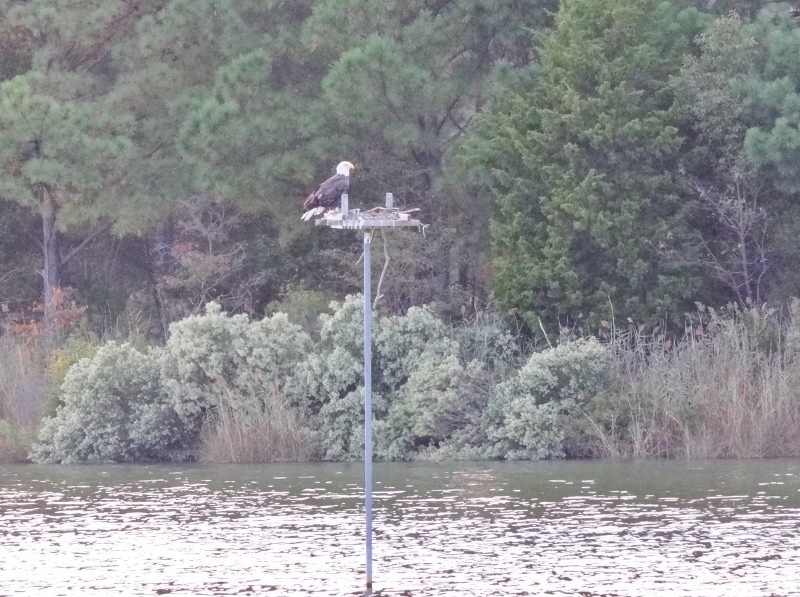 He hung out there for quite some time and seemed to be pondering the nest; certainly he sat in judgment as only a majestic bird can. Anchored at Solomon’s. So it happened again, I look out the front window to see this hawk (haven’t seen a hawk in ages) come down from the trees, wings flapping. 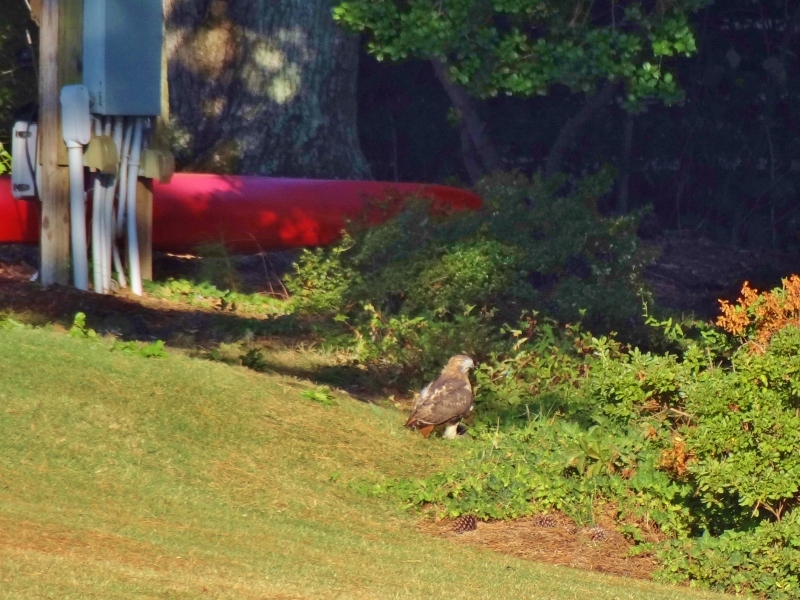 When I saw a small rabbit make a clean get away I figured the hawk missed, but well, not so. He sat there, so I grabbed my camera and got this shot. Just as I snapped a second shot, he flew off. 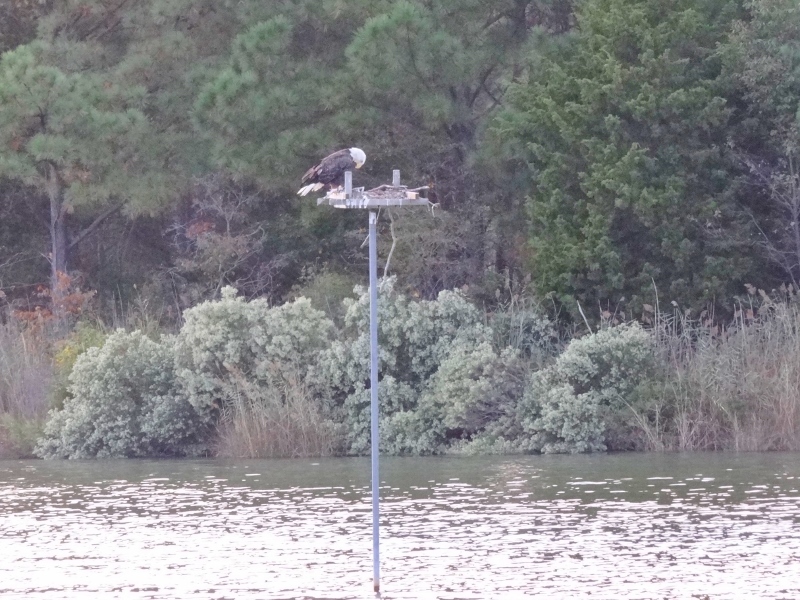 Anchored up Back Creek- watched as this guy swooped down from the trees. Saw a rabbit dash out from the bushes over the grass and to safety. But he/she sat there for several minutes. We wondered. 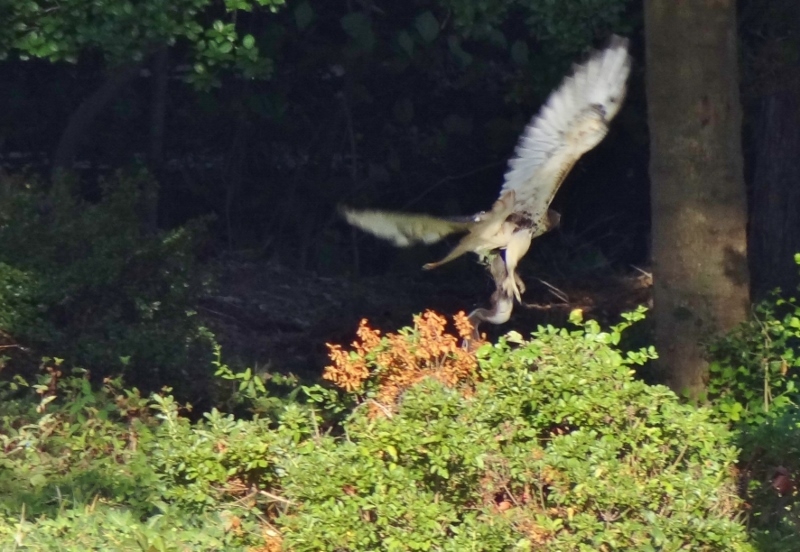 When I downloaded the photos, it became clear that the rabbit was not the prey; an unlucky squirrel was the target. Seconds later he takes off as I’m getting off the next shot and wow- look- got a squirrel and was waiting for it to expire before flying off. Absolutely one of my most lucky shots ever. Usually I’m seconds too late. Still, a new camera is in our near future. Where is that shallow water, near Twin Sisters, on the picture of your blog? Is it Redshank Key, Great Exhuma, near Georgetown ? Bonjour Jean and welcome aboard! I can see why you thought that it might be near Redshanks, but no. The location is at the large & long sandbar a bit west of Cave Cay. Exumas of course. The day was Light & Variable and low tide was approaching, so we dropped the anchor close to the sandbar. You know how I love to beachcomb; it’s one of my favorite places.